Minesweepers competition arena with surface and buried mines. Minesweepers: Towards a Landmine-Free World is an outdoor robotic competition initiated by IEEE Robotics and Automation Society – Egypt Chapter that aims to raise public awareness of the seriousness of the landmines and unexploded ordnances (UXOs) contamination and the role of science and technology in solving this serious problem. The final competition took place last month at the University of Coimbra in Portugal. 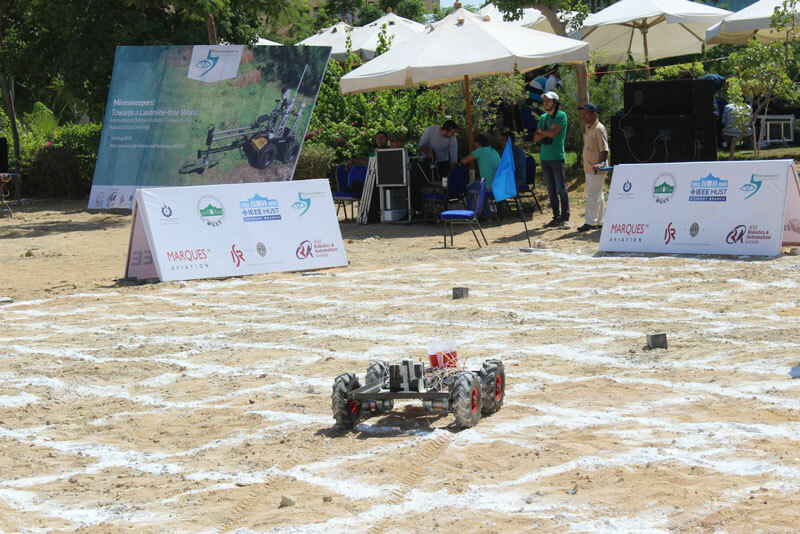 Minesweepers was designed as a technical challenge to motivate new research and applications of mobile robotics in the area of humanitarian demining, and participants had to face many challenges not typically found in other robotic competitions. The rough landscape of the minefields can take a toll on a vehicle’s locomotion system, and the sunny, hot and dusty climate makes it impossible to use traditional electronics meant for indoor use. Minefields are also frequently strewn with small metal fragments that can camouflage landmines and cause high false detection rate, and so detection systems must be able to differentiate between buried/surface mines and randomly scattered metal fragments. Minesweepers–Academia: for undergraduate and postgraduate students, where only metallic objects are in the competition arena; landmine detection and minefield mapping were required. Minesweepers-Juniors: for elementary and high school students, where only metallic objects were in the competition arena; only landmine detection was required. Minesweepers–Industry: for professional companies where metallic and non-metallic objects with different dimensions and profiles were in the competition arena; and landmine detection, landmine imaging and minefield mapping were required. 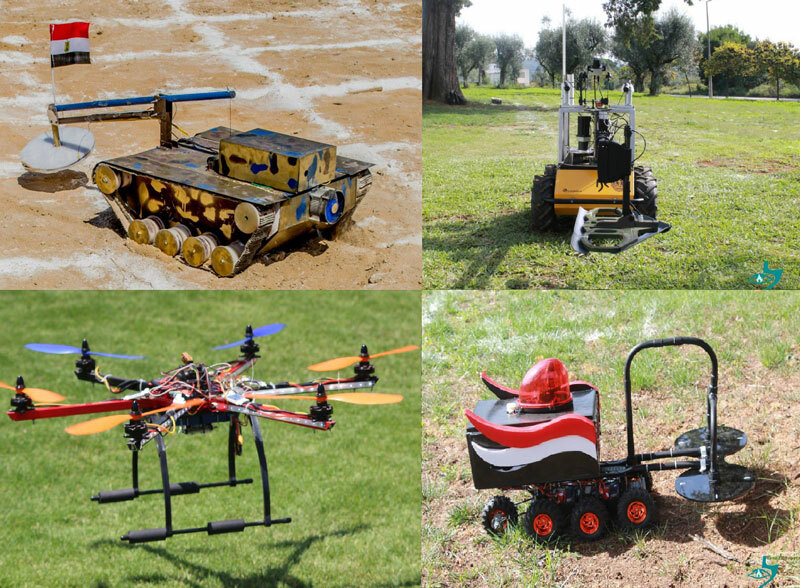 Some of the robots participating in the local and final rounds of the Minesweepers competition. Each participating team was required to construct a teleoperated/autonomous unmanned ground/aerial vehicle that could search for underground and aboveground anti-personnel landmines and unexploded ordnances (UXOs). Teams had to visualize the position and the type of object and overlay this information on the minefield map, and their robots were required to navigate through rough terrain that mimicked a real minefield. The competition attracted many undergraduate and postgraduate students from various universities who were primarily motived by the technical challenge and the need to raise awareness about the problem of humanitarian demining. 115 teams from 9 countries subscribed to participate in the competition, 45 of which passed the eligibility round. A local round was organized in Egypt as a classification round for the final event in Portugal. In this local round, 35 teams participated, and the best three teams from each category went on to participate in the final event in Portugal. Participants in the final round in Coimbra, Portugal. Five teams from Portugal and Egypt successfully participated in the final round of the competition: Husky team (ISR, University of Coimbra, Portual), Pioneer team (1st place, MUST-Misr University for Science & Technology, Egypt), Robosapien team (2nd place, October 6 University, Egypt), Minebusters team (3rd Place, German University in Cairo, Egypt) and Divergent (1st Junior team, Mansoura High School for Girls, Egypt). Other four qualified teams from Belgium, UK, Bolivia and Tunisia were unable to join the final round due to financial and technical problems. No teams qualified to participate in the industry category. The success of the Minesweepers competition will be measured by its long-term sustainability. The goal is to run the competition annually, and next year more technical challenges will be considered, such as exploring the applicability of multirobot systems in minefield reconnaissance and mapping. The ultimate goal of this competition is to put into practice the new strategic mission of IEEE, “…to foster technological innovation and excellence for the benefit of humanity” and to serve as an educational and a research forum to provide efficient, reliable, adaptive and cost-effective solutions for the serious problem of humanitarian demining, which impacts many countries across the world. The competition also motivates the participants to create new companies and industries geared towards minefield reconnaissance and mapping technologies. The applicability of the robotic systems presented in this competition can be extended to a wide range of other applications such as security and surveillance, search and rescue, health monitoring of civil infrastructure, pipeline monitoring, and environment monitoring. 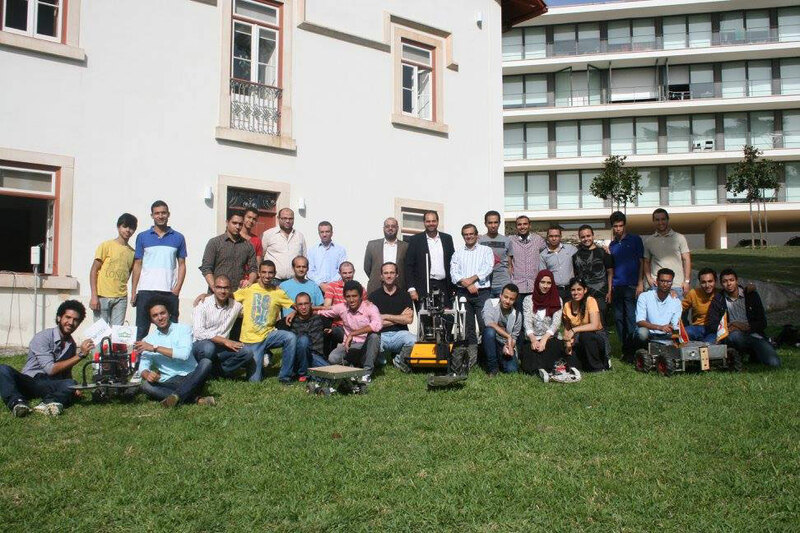 Minesweepers was organized this year by the Institute for Systems and Robotics, University of Coimbra under the auspices of IEEE RAS Special Interest Group on Humanitarian Technology (RAS-SIGHT) and in collaboration with Hadath for Innovation and Entrepreneurship. Generous support was also provided by the Academy of Scientific Research and Technology (ASRT), Misr University for Science & Technology (MUST), October High Institute for Engineering & Technology and IEEE Robotics and Automation Society.